This new Reader brings together classic pieces of gender theory, as well as examples of the sophistication of contemporary gender theory and research methodologies in the field of education. Leading international gender researchers address current debates about gender, power, identity and culture and concerns about boys' and girls' schooling, gender achievement patterns, the boys' education debate, and gender relationships in the curriculum, the classroom and youth cultures. 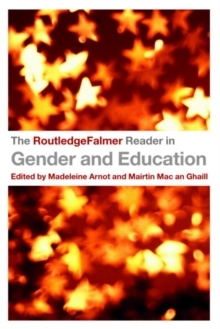 "The Reader" is divided into six sections which reflect contemporary concerns about Gender and Education: Gender and Educational Theory; Difference and Power; Identity Work; Knowledge and Pedagogy; Reflexivity and Risk; and, Gender and Citizenship. A specially written Introduction from the editors, both experts in feminist and masculinity research, provides a much-needed context to the current educational climate. Undergraduates, postgraduates and academics interested in education, gender studies and women's studies will find this a stimulating and important resource. The analysis of the gender dimensions of the curriculum, teaching and alternative pedagogies also provide important insights for practitioners wishing to promote gender equality.